Heard of the Creative Cloud Packager? The Creative Cloud Packager is a tool for CC Enterprise and CC Team customers that enables them to easily package Creative Cloud products and updates for deployment within their organizations. It lets you select specific Creative Cloud products and/or updates and package them into .pkg or .msi installers (optionally with a serial number for Enterprise customers). These packages can then be deployed on their own or integrated with third-party deployment tools like JAMF Casper or Microsoft SCCM. The Creative Cloud Packager even lets you control Creative Cloud update behaviors and more. With the recent releases of Creative Cloud Packager, you can now edit existing deployment packages, create deployment packages from local media (DVDs), and even create deployment packages for older (CS6) creative applications, if you have the proper license. Want to learn more about the Creative Cloud Packager or get specific information on deployment package details? Do not miss the Creative Cloud Packager help documentation. If you’re looking for an overview, don’t miss these videos covering the Creative Cloud Packager for both Enterprise and Team customers. In addition to my addiction to aerial photography, I’m also fascinated by time-lapse photography. With time lapse photography, you set up your camera to take pictures on an interval. This could be every few seconds, every few minutes, every few hours, or heck, once a day. It’s really up to you how you want to set up your shots and what you want to shoot. In any case, you can end up with a lot images – each by itself could be great, but it only tells a limited story. However, you can put all those images together in a sequence to create some truly amazing visuals. Subtle motion becomes pronounced, and you can clearly view the passage of time. Often, this ends up with an amazing visual story that would be hard to otherwise capture. All that you need start diving into time-lapse photography is a camera that is capable of capturing images on an interval – normally there is some kind of time lapse mode that lets you set up your image frequency and duration. Then, once you’ve got your images, you can process them with Creative Cloud tools to bring out their full potential. Here are two time-lapse sequences I created this week–one a snow storm, one a sunset. The sunset was a ten second interval captured over about 2 hours and played back in 30 seconds. The snow storm was a 60 second interval captured over roughly 14 hours, played back in 40 seconds. So, you’ve captured the images, what next? You can check out the video below, or read on for further explanation how I processed and assembled the images into a video sequence, complete with links to Adobe documentation and tutorials. Before putting everything together as a sequence, I wanted to enhance the photos to bring out as much detail as possible. Here’s where Adobe Lightroom comes into the picture. I used Lightroom to import all of my photos, add them to a collection, and then perform bulk/batch processing to enhance all of the images. First, select an image to use as your baseline for adjustments. I wouldn’t start with your darkest image, and I wouldn’t start with your lightest either. I normally start somewhere in the middle. Select the image, and then switch over to the “Develop” module. I use the basic panel to make adjustments to this image. For the GoPro, I like to bring up the shadows and bring down the highlights to pull out details out. If I’m shooting a landscape, I also like to bring up the clarity and maybe even the vibrance and saturation – just don’t over do it. 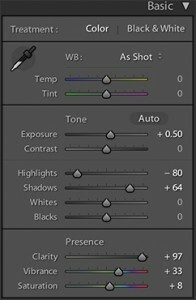 You could also use one of Lightroom’s presets if you want; it’s really up to you. Just be extra careful that it is not too dark or too light b/c we’re going to apply these settings to all images in the sequence. If you want to adjust hue, saturation or luminance of specific colors, you can do that within the HSL/Color/B&W panel. Using this you can make specific colors more or less intense. I normally try to tone down the yellows in my GoPro images after I’ve increased overall saturation. Since I used the GoPro, there is a lot of fisheye distortion from the lens – the GoPro has a 2.77mm lens whichgives an ultra-wide 170 degree field of view. This makes for some awesome wide angle shots, but sometimes you don’t want that extreme distortion. This is where lens correction gets really handy. Next, I opened up the Lens Correction panel. 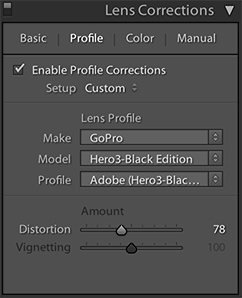 As soon as you check the “Enable Profile Corrections” checkbox, Lightroom should automatically select the GoPro Hero 3 Black Edition lens profile based upon metadata within the image. I didn’t want to fully flaten the image, just reduce the wide angle, so I turned down the distortion correction using the “Distortion” slider. Once you have your baseline image the way you want it, you need to apply these settings to all of your images in the sequence. Just select them all, and then either click on the “Sync…” button in the bottom right of the Develop module, or use the Settings -> Synch Settings menu. This will apply you changes on this image to all of the images that were selected. This will happen automatically if you are using auto-sync. 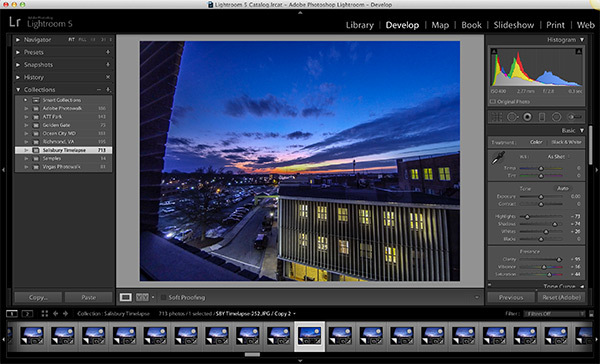 You can learn more about synchronizing metadata between photos in the Lightroom documentation. Next, be sure to view several images in your collection, the lightest to the darkest, and make sure they all look decent. If you need to make any changes because they are too light, or too dark, or don’t have the right contrast, then now is your time to fix it. Once you’re happy with the images in your collection you next need to export them. I exported as JPG with 100% quality at full resolution with sequential names. Now we’ve got a lot of processed images. What’s next? We need to make a video! At this point, I switch over to Adobe Premiere. 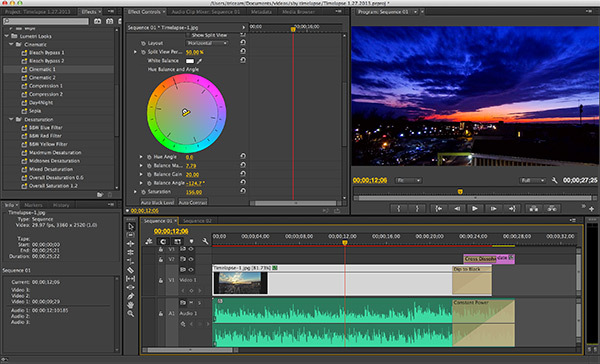 Premiere is an incredible tool for producing videos. It makes the process of arranging video compositions very easy. It’s easy enough for a beginner to use, yet powerful enough to create high-dollar Hollywood productions. If you haven’t used Premiere before, definitely check out my Crash Course in Premiere, check out Video Editing for Non-Video Professionals, and don’t miss the Adobe Premiere channel on Adobe TV. The first thing to do is create a new video project, then create a new sequence. If you want full HD, you’ll want to select an one of the 1080p presets (or create a custom sequence). 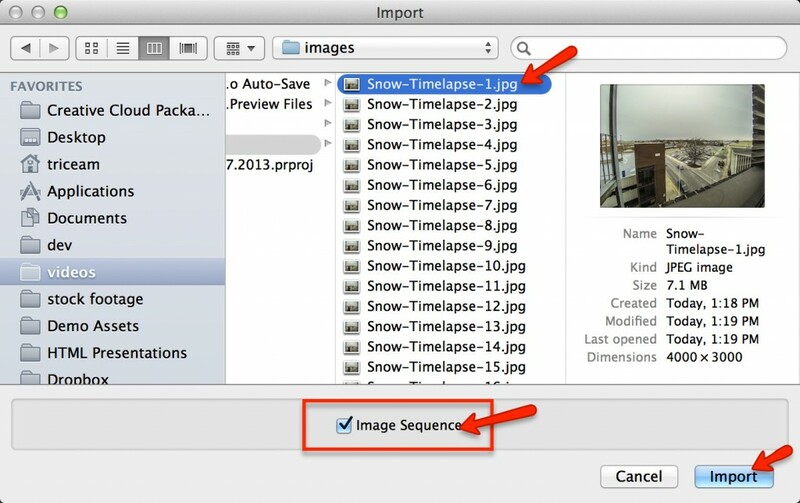 Once you have your sequence created, you need to import your images for editing. Once imported, the image sequence will be treated like a video clip within Premiere. Drag it onto your sequence timeline, then start editing. You can speed up or slow down playback with time remapping, apply color correction, add transitions, or more. Then add a title, add some music, and export it. If you’re wondering how I got the motion in the time lapse sequence, no I didn’t have the camera moving. There are devices which make this possible, but I just used a video editing trick. The images are 12 MP, or 4000 by 3000 pixels. A “standard” HD video sequence is 1920 by 1080 pixels. 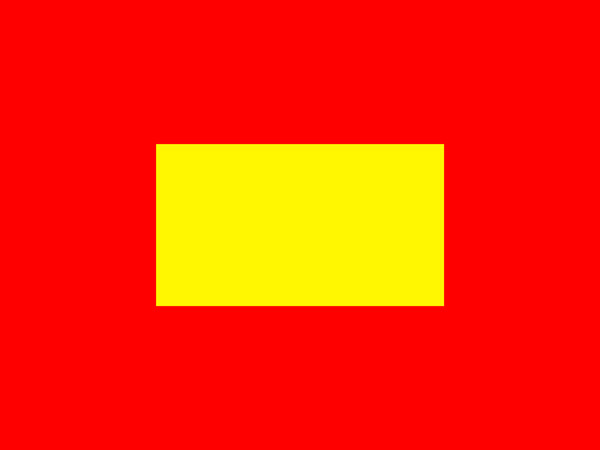 The image below reflects this scale – the red area represents the 4000 by 3000 still image, and the yellow represents the 1920 by 1080 video. You’ll notice that leaves us with a lot of room to zoom and pan around the image. I zoom into the image so that it fills the entire horizontal space within the video sequence – you can zoom in more if you want. This leaves a fair amount of vertical content outside the clipping rectangle of the video. You can use this to your advantage by panning vertically within this area. I just made the pan very slow and deliberate so it appears that there is constant motion of the camera throughout the entire video. The final result is that the content in the video (yellow area) appears to move because the actual image sequence is moving relative to the video viewport. Photosynth is an impressive service from Microsoft. 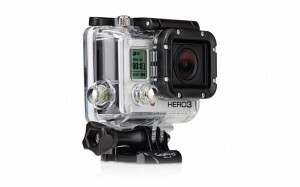 It enables you to upload photos and turn them into interactive 360 panoramas, photo walls, spins, or photo walks. The Photosynth team recently announced a new version of Photosynth, and it’s a really cool web experience. It leverages WebGL to visualize the content, and runs great on both desktop and mobile devices (as long as the devices support WebGL). Those who know me well or regularly read the blog probably already know I have an obsession with aerial photography using remote controlled multirotor helicopters. Once I discovered Photosynth, my first thought was “Wow, these ‘Photo Walks’ will be incredible to visualize flights”. I capture most of my flights in time-lapse photography mode with a GoPro camera attached to a DJI Phantom copter. The time-lapse images are perfect for Photosynth – I normally capture on a two second interval, though the Photosynth team suggested trying an even shorter interval for better results. To generate the best Photosynths, you need to start with the best photos. This is where Lightroom comes into the picture. Lightroom is an incredible tool for editing photos and bringing out their details. You can enhance exposure, colors, clarity, saturation, reduce noise, and more. Even better, it excels at bulk image editing. Thus it’s perfect for processing your photos for preparation to create a Photosynth. Check out the video below to get an overview of Photosynth, and preparing your photos with Lightroom. Now, you’re ready to learn more about both Lightroom and Photosynth, right? Don’t miss this series on Getting Started with Lightroom 5 on Adobe TV, or Terry White’s “How To Get Started With Lightroom“. Don’t have Lightroom? Just become a member of Creative Cloud, and you can get Lightroom and Photoshop today! Then check out Photosynth to learn more and sign up for the preview. Below are Photosynths from a few of my flights. If your browser supports WebGL, you’ll be able to see the fully interactive experience – you’ll be able to scrub through the photos, zoom in, and pan the images at full resolution. It’s best viewed in full-screen mode. If your browser doesn’t support WebGL, then you’ll just see a video of the Photosynth playback, which is still cool, but nowhere near as cool as the interactive experience. Check here to see a matrix of browsers that support WebGL. Note: In Chrome on Android you have to manually enable WebGL support. For example, you can place a .ai Illustrator file inside of a PSD as a Linked Smart Object, and when you update the content in Illustrator, the content in Photoshop is automatically updated. Check out the video below for more detail. Be sure to check out the Creative Cloud learning resources to learn more about Linked Smart Objects. This is a FREE update for Creative Cloud members. If you’re not already a Creative Cloud member, join today to get the most out of all of the tools that Adobe has to offer!